Ready for another easy-peasy tutorial? I sure hope so, because you are going to love how easy it is to make this next project. 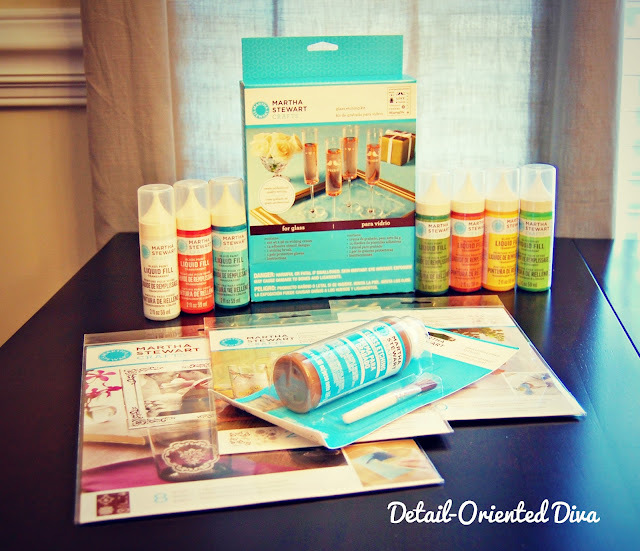 I recently received a box full of goodies from Martha Stewart Crafts to try out as part of the Martha Stewart glass painting program. I was so excited to get started on etching some glass! 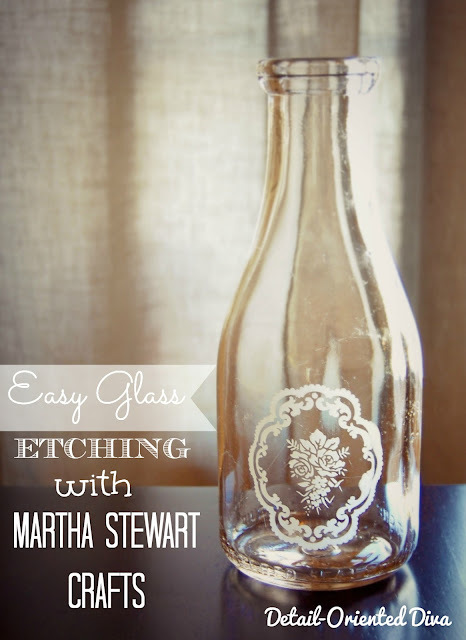 All of these materials (except the glass) can be found in the Glass Etching Kit by Martha Stewart Crafts. Step One: Before beginning, I made sure to wash my glass with soap and water. I then cleaned the surface with some rubbing alcohol. Step Two: I cut my silkscreen out from the sheet following the border as a guide. 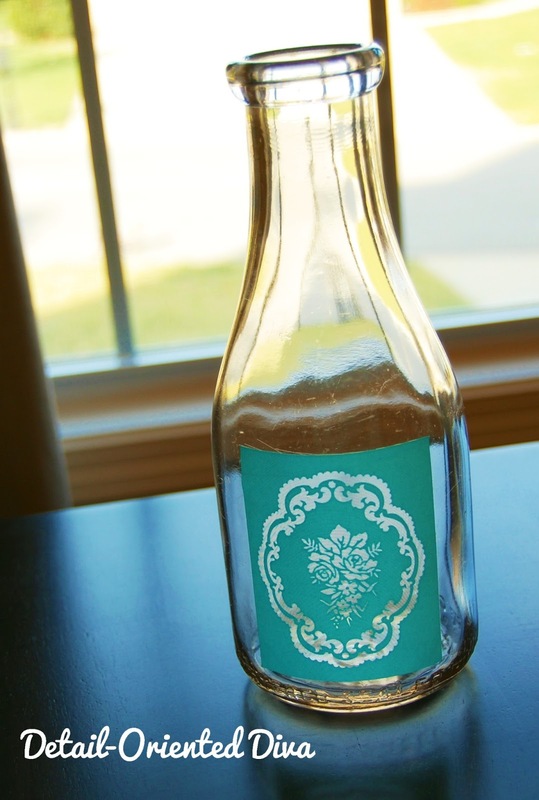 I then sized the design and made sure I liked the way it looked on my bottle. 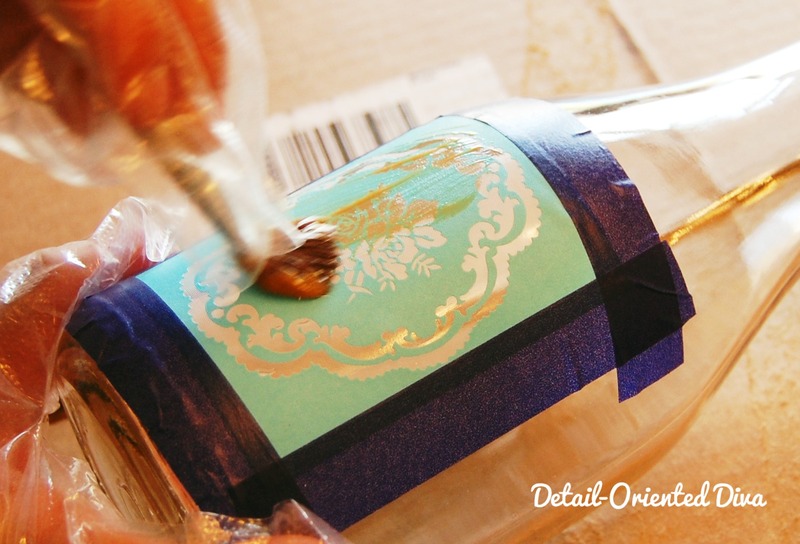 Step Three: Once I had sized my design, I peeled the adhesive silkscreen from the backing and applied it to the bottle. I made sure to smooth out any bubbles. I then secured it further with some painter's tape because I'm kind of a messy girl. This gave me a little room for error to make sure that I didn't accidentally spread the cream on any areas I didn't want etched. I'm not the greatest at coloring inside the lines. LOL! Step Four: Next, I placed an old flattened box on the table to protect my surface. I then put on the protective gloves. Always use gloves when handling the etching cream. If it can etch glass, think of what it could do to your hands or table! I then began to apply the etching cream to the silkscreen. Paint the cream over the entire design evenly and paint it generously to ensure full coverage. After you have finished applying the cream, let it set for about 30 minutes. Step Five: Rinse the glass under running water. Make sure to rinse all the cream off thoroughly first. Then you can remove the silkscreen and tape. And you are done. 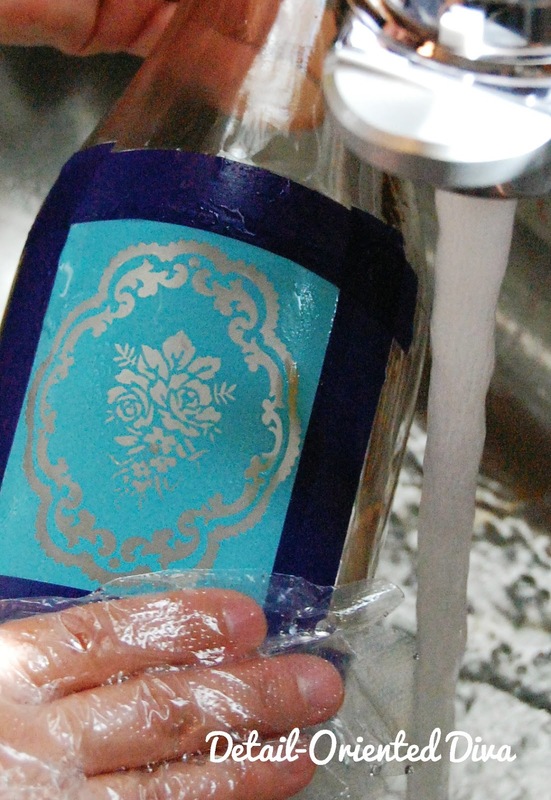 Just make sure to wash the glass with soap and water thoroughly before use. Wow this is beautiful. I love the idea of applying the border of painters tape! This looks perfect for a little flower in a kitchen window seal. Reminds me of spring. So glad you like it! Thanks a bunch! So pretty! 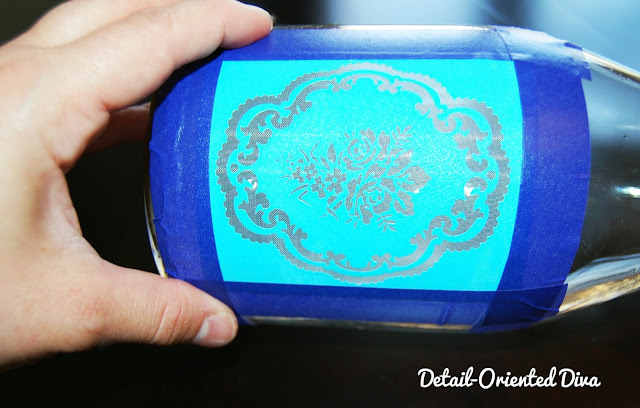 I never realized how easy it is to do the etched glass look! 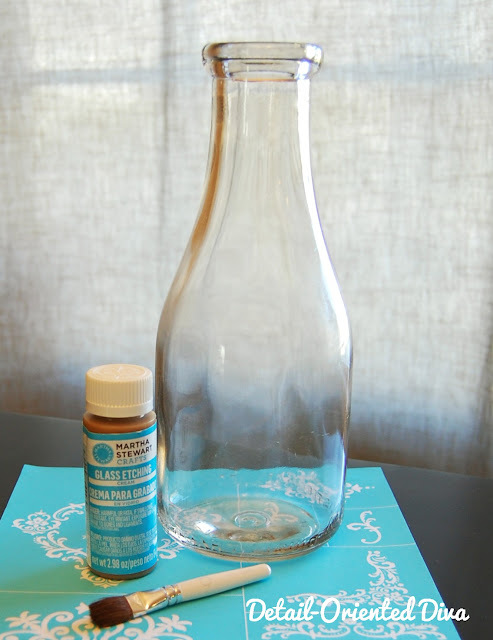 I'm going to have to make a trip to the craft store and try this myself! Love this! 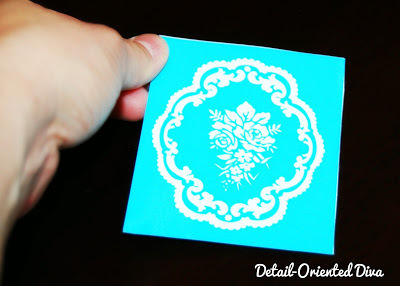 Can you reuse the stencils, or are they 1 time use? Thanks! The stencils are reusable. They won't be as sticky as the first time though, so you might want to use more tape. Thank you! 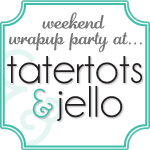 I'm going to try it next weekend!